Jake serves as Director of Federal Affairs for the Advanced Technology and Research Universities & Institutions Practices at McAllister & Quinn. Jake works with the firm’s clients on tracking and analyzing legislation on technology, defense, and energy R&D issues. Jake also conducts research activities related to government procurement, R&D, and other business development opportunities to support clients’ commercialization goals and provides clients with strategic data on the Department of Defense (DOD), the Department of Energy (DOE), and the Department of Commerce (DOC), as well as state government programs. 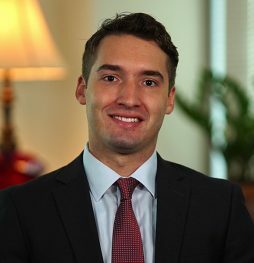 Prior to joining McAllister & Quinn, Jake was a Policy Analyst for the University of Washington Graduate School, where he focused on federal and state policy matters related to university research and commercialization. Before this, Jake served as a Market Research Analyst for PACCAR INC., a Fortune 500 manufacturing company. Jake also brings knowledge of the legislative process through his time interning for former Congressman Thomas Petri (WI). Jake graduated from the London School of Economics with a Master of Science in political economics and received his bachelor’s degrees in economics and history from the University of Washington. Market Research Analyst, PACCAR, Inc.